First of all; Thank You Honey for your patience. I hope you feel it was worth it. 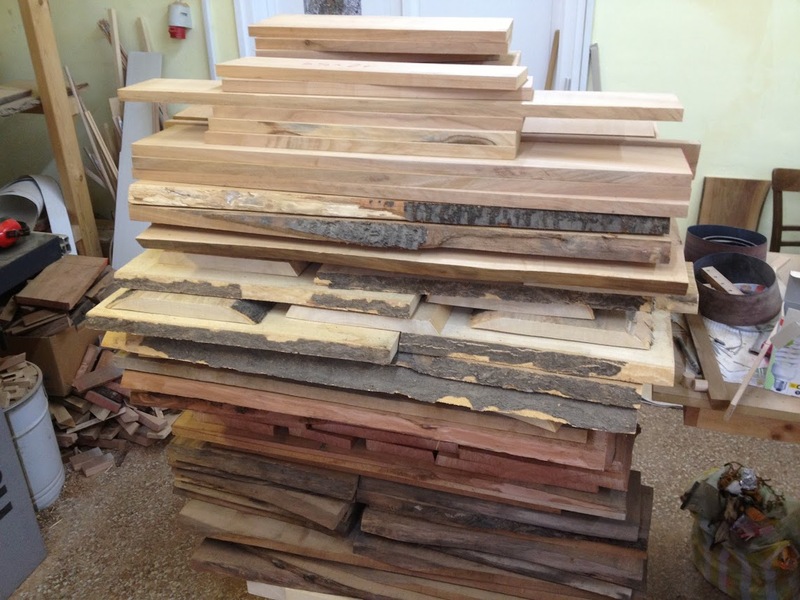 I’ve had the vision of an all wood kitchen for about two years. Practicing certain techniques finally allowed me to realize this vision. The actual build of the lower kitchen cabinets took 4 months. We had planned the layout quite a lot with my dearest. Finally I got the plans approved by her. 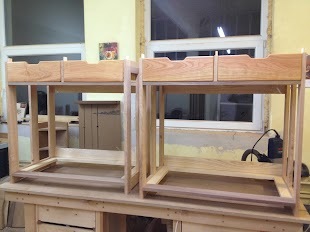 I designed the cabinets to be modular because if we want to move in the future we should be able to rearrange these cabinets to suit any new kitchen. 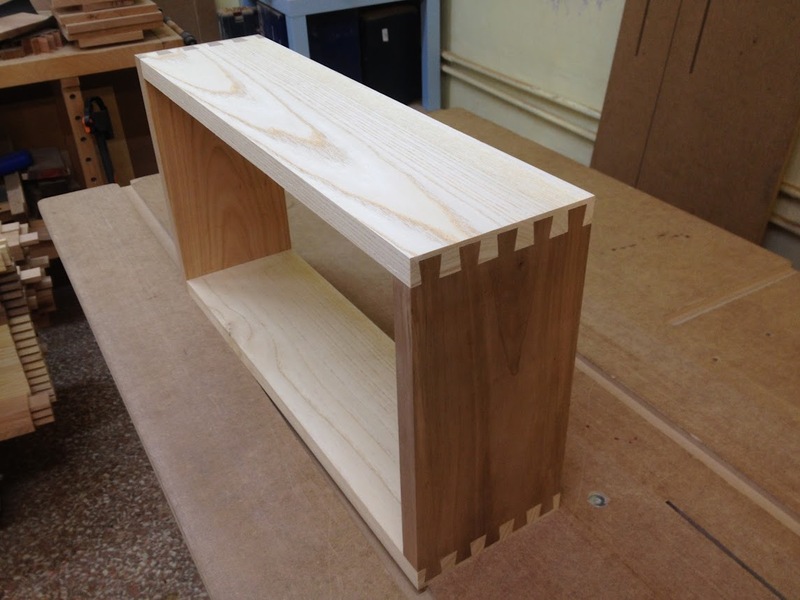 To ease the production I carefully defined a standard width for these cabinet modules (37”). So one module has the sink and two are basic cabinets – two spacious drawers under the counter and two shelves underneath – I call’em hutch 1 and hutch 2. They’re stand-alone. One narrow (25”) module is obviously the fireplace. The other narrow asset is a fridge. 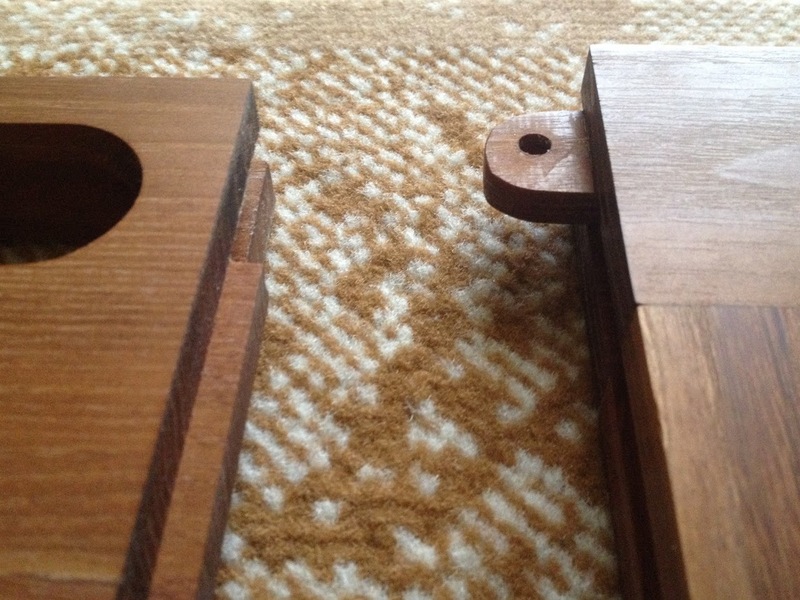 It has no actual cabinet – there is only a counter ‘bridge’ above it. Fridge bridge hereafter. :-D The fridge is between the sink cabinet and the fireplace cabinet. Hutch one is on the right of the fireplace, hutch two is in the opposite corner of the kitchen. So these cabinets actually surround our table – quite convenient. We just love it! 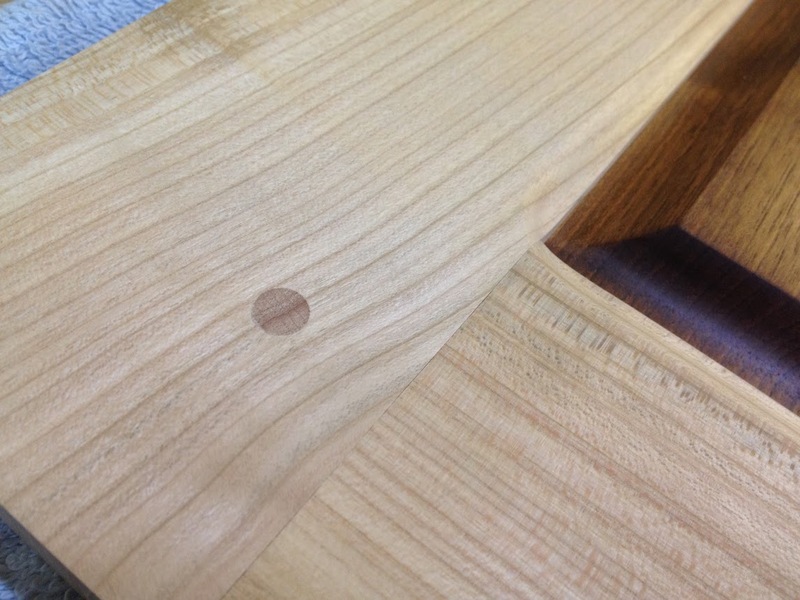 The top is steamed black locust. 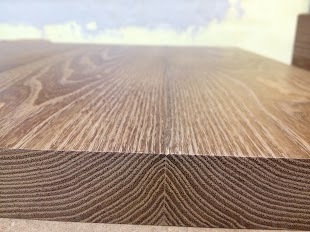 It looks fantastic; it’s very hard and strong – perfect for counter top. 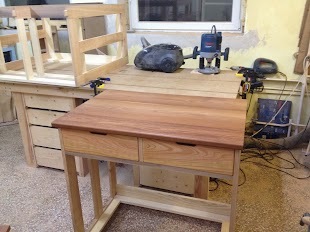 I’d had several option for primary (seen) wood surfaces but finally I decided to play with walnut inside-out. 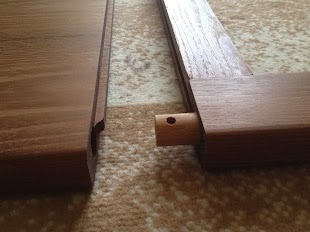 So while the panels are walnut on the sides, the doors (front) have walnut frames. 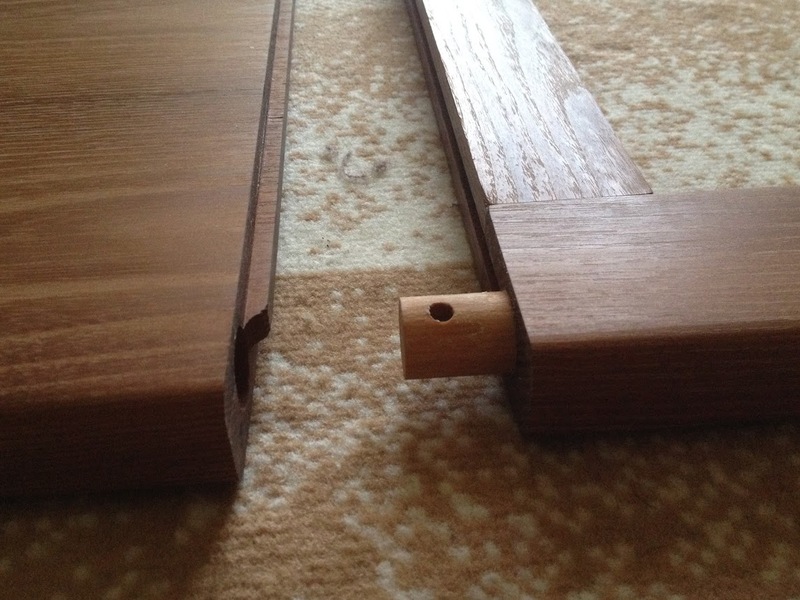 Hence the doors run in walnut slides. Cherry has a similar twisted role. 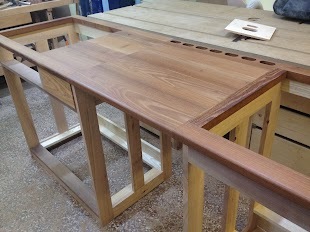 The frames on the sides, the drawer fronts and the toe-kick are cherry. 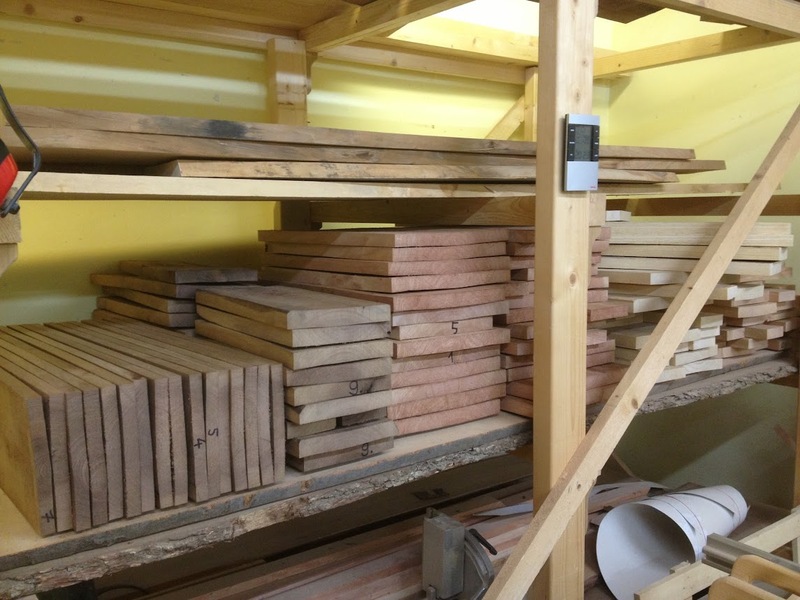 The door panels are steamed burly red willow – it’s just gorgeous and really lightweight – perfect for panels. Besides, the upper cabinets had had the same door panels. I used red willow for shelves, for the back and for drawer bottoms. 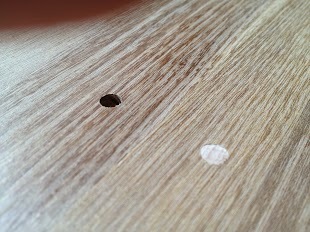 The other secondary wood was ash. 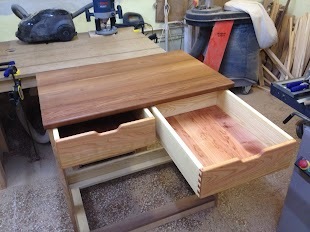 I used it for drawer sides and for every hidden structural part. 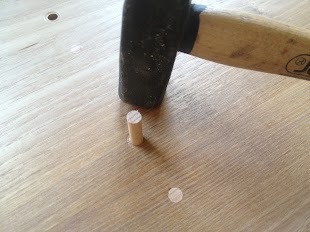 The dowels/pegs are beech. Having had some experience in edge joining by sliding dovetails, I was looking for another (stronger) option. 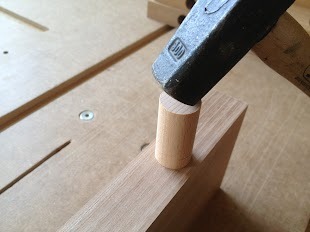 I voted for pegged dowels. 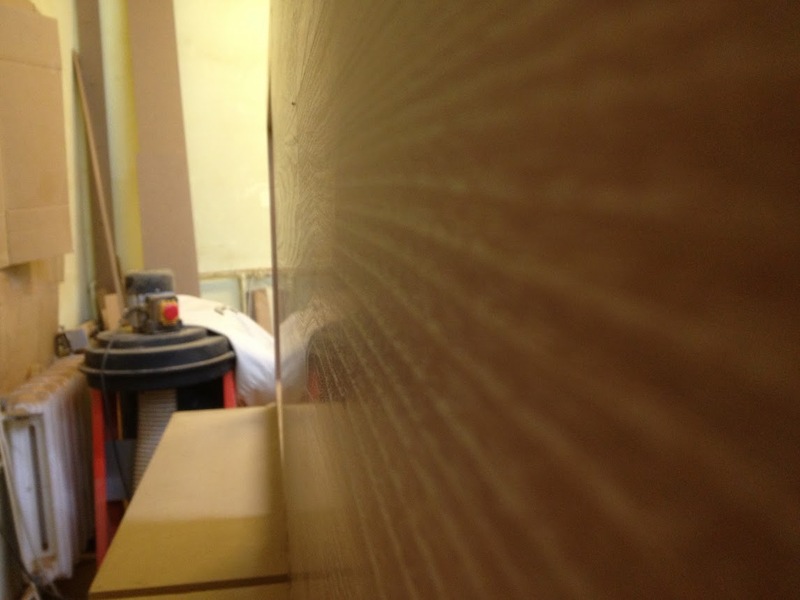 The principle is simple; 30mm thick boards, 20mm dowels, 6mm pegs. 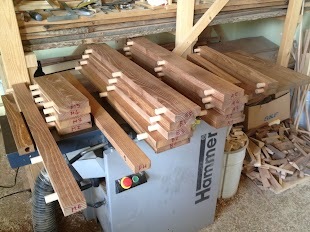 Since I’m pretty much aware of the inaccuracy of my drill press, I routed the mortises for the 20mm dowels. 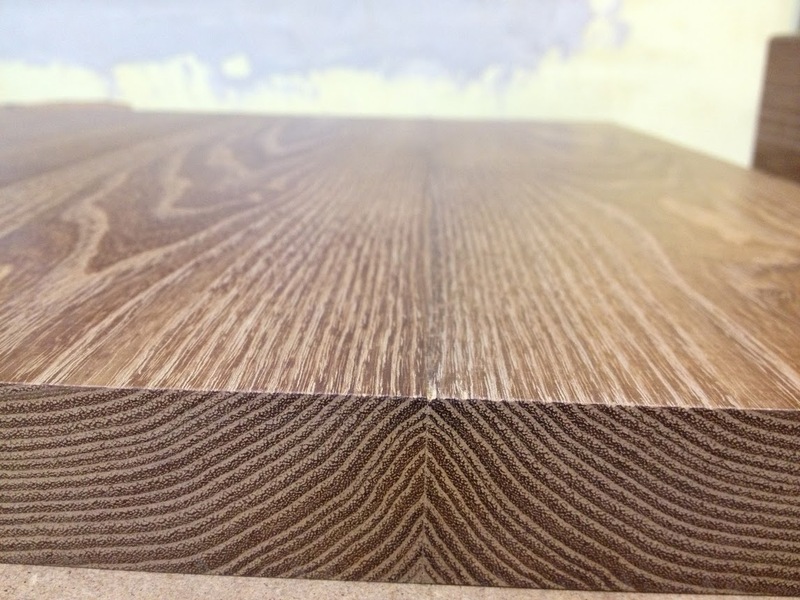 It came out so precise that I didn’t need to sand the top at all. 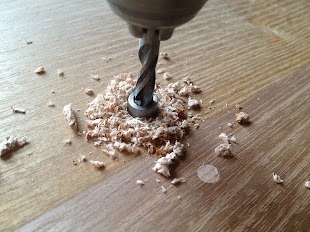 I did give it a 400 grit sanding before finishing, however. 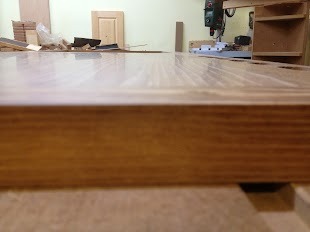 The finish is raw tung oil, BTW. Frame and panel throughout. Pegged M&Ts. 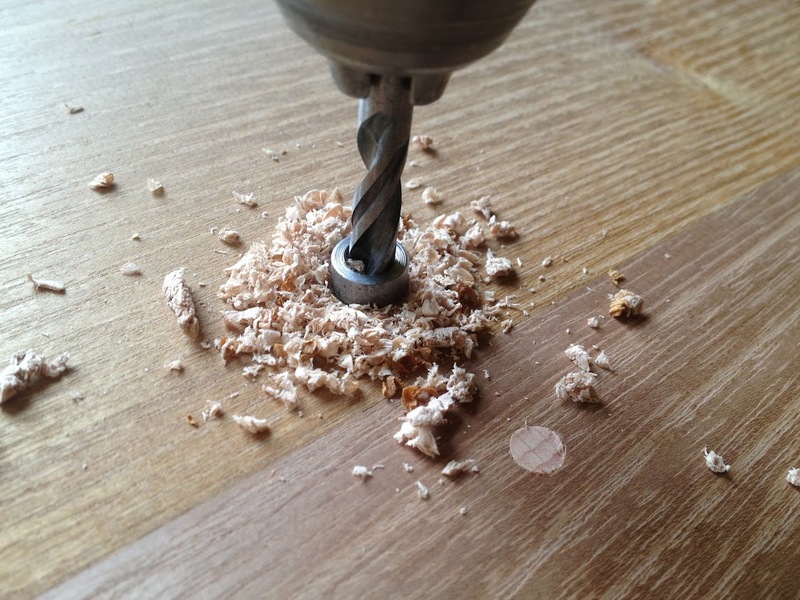 See here how it’s made. 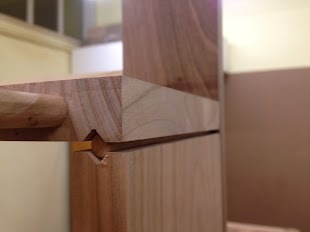 Pegged half blind dovetails. The drawer fronts are rounded and a bit proud. This was the simplest drawer slide I could think of… Almost full extension as well. The lower shelf has actually the door slides as well. Hence, frame and panel. 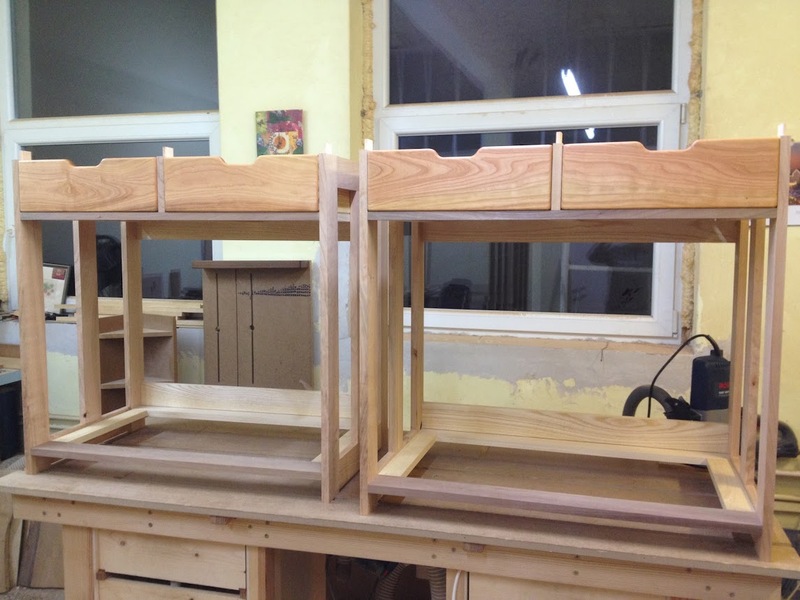 The upper shelf rests on brackets that are dowelled to the sides. 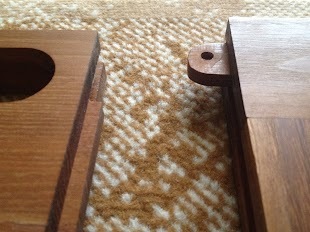 Sliding, frame and panel, pegged M&Ts. Black chalk board latex paint on the wall adds tremendous room for love notes, menus, memos, drawings, etc. We just love it! The little shelf (red willow) crowned the kitchen job. That is awesome! I have to keep my wife from seeing this! 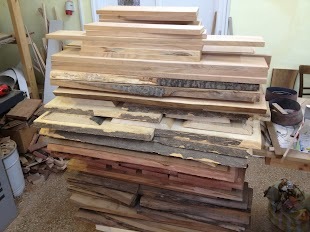 I am interested in your raw tung oil finish, I just started experimenting with tung oil yesterday. I have always stained and lacquered everything in the past. Best kitchen project I have seen on here. This is a beautiful kitchen. 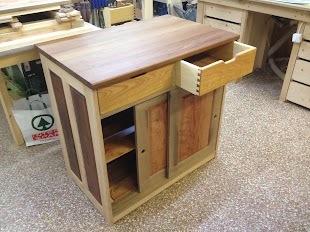 I think the term here for what you have designed and built is kitchen furniture! You were true to your vision and you satisfied your customer! LOL! A lot of excellent work and long hours. Amazing job. Must feel good to look at those pictures. Certainly beats the kitchen I built a few years ago. Absolutely gorgeous and very well executed. We are moving to our new house, and we stil don’t have a single piece of furniture. I’m taking a lot of ideas from this beautiful kitchen, hope you don’t mind. Thank you Johnny – I’ll be coming back to this project! Beautiful craftsmanship. 1 question. How come no toe space on the bases??? 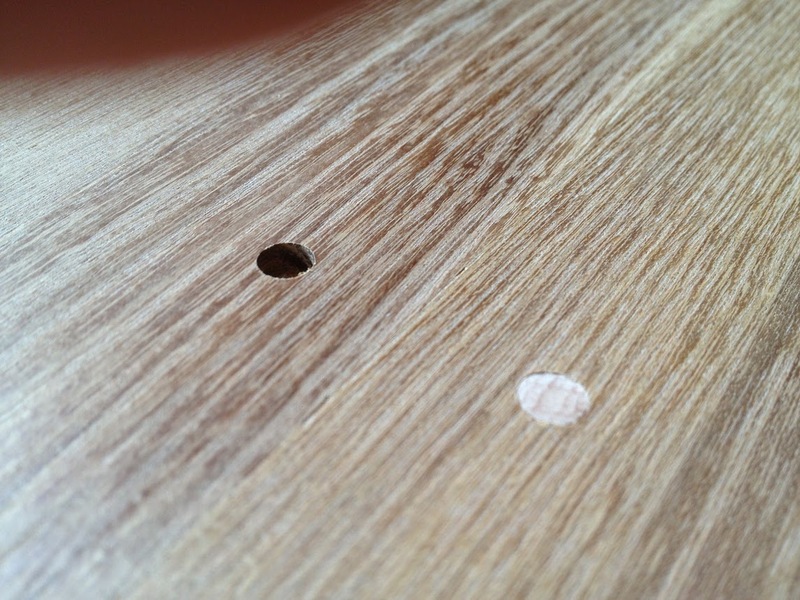 Did you make yourself a jig for routing the dowel holes? Nice job.